Now, I’m not a professional reformation scholar, but I do play one on TV…or in my undergraduate classroom. When it comes down to it, I describe myself as a “gifted amateur” in the field. So take my recommendation for what it’s worth. But I came away with a very positive impression of this work. 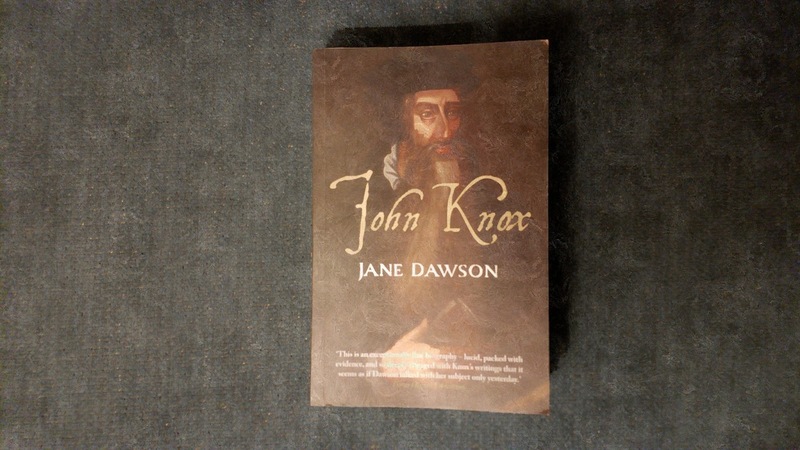 For one thing, Dawson draws on new manuscript material from Knox found in the papers of his friend, Christopher Goodman – “the first new Knox material unearthed since 1875” (4). For another, Dawson paints a lifelike picture of Knox, warts and all, emphasizing aspects of his character that had not previously stood out to me, such as his intuitive grasp of language’s power, his effectiveness as a hub for intelligence and its analysis, his deep friendship with Goodman, and his showmanship. I also appreciated how Dawson teased out Knox’s idea of “kindness” and placed it in the context of Scottish social relations, and learning about the six men named “John” who teamed up to accomplish so many key pieces of religious reform in Scotland. There's also a list of further reading by chapter. But if I go on much longer this book note will no longer be brief.